During a shark-filled week on a live aboard dive boat in the Galapagos Islands, the luxuries are less about boosting thread count and more about boosting your pulse rate. The captain and crew of the M/V Galapagos Sky live aboard dive boat were wasting no time. As soon as her 16 passengers, from Hong Kong, Austria, Switzerland, Ecuador and the United States were settled on board we were underway—headed to the far northern reaches of the Galapagos Islands, where mega currents attract schools of hammerhead sharks so dense they block out the sun. Whale sharks the size of 18-wheelers appear out of nowhere. Ethereal manta rays seem to fly by and prehistoric-looking endangered sun fish, called mola mola in Spanish, can still be spotted. The Galapagos Sky live aboard dive boat anchored near The Arch dive site off Darwin Island in the Galapagos Islands in Ecuador. More than 600 miles (1,000 km) off the Pacific coast of Ecuador lie the Galapagos Islands, an archipelago of 16 main islands, three smaller islands and a number of islets. Formed volcanically between eight million and 90 million years ago, the Galapagos started showing up on maps in 1570. Pirates discovered place in the 17th century and began using the uninhabited islands for R&R, boat repairs and to stock up on fresh water and food. The Galapagos Islands were made a national park by the Ecuadorean government in 1959 and UNESCO added the Galapagos as a World Heritage Site in 1978. Today more than 200,000 tourists visit the Galapagos Islands each year, a burden which landed the Galapagos Islands on UNESCO’s list of World Heritage Sites in Danger in 2007. The islands were removed from the threatened list in 2010 after the Ecuadorean government strengthened environmental and tourism regulations in the region. The Galapagos Islands are named after a Spanish word for saddle since the shells of the massive Galapagos tortoises reminded Spaniards of saddles. Named after a Spanish word for saddle — since the shells of the massive Galapagos tortoises reminded the Spaniards of saddles — the Galapagos Islands cover 137 miles (220 km) from the southernmost island (Española) to the northernmost islands (Wolf and Darwin). Darwin Island is named for the region’s most famous visitor. Charles Darwin arrived in 1853 as a naturalist on board the HMS Beagle. Over the course of just five weeks in the Galapagos he began formulating his game-changing theories about evolution and natural selection after observing unique adaptations in common species like the finch. Darwin did most of his species-spotting on dry land but the divers on board the Galapagos Sky, which would serve as our mobile hotel, restaurant and dive shop for the next seven days, were more interested in the species lurking below the surface of the cold, swiftly-moving water. 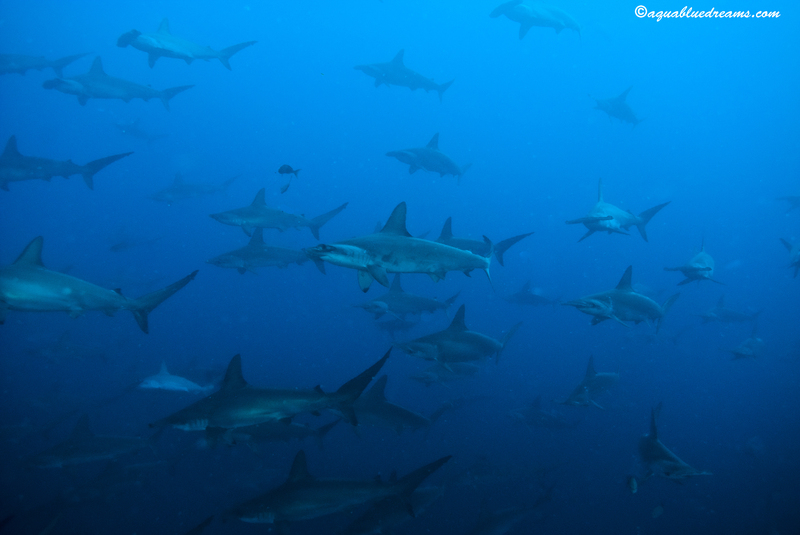 Divers in the Galapagos Islands can see large groups of cruising scalloped hammerhead sharks like these. Dolphins played alongside the Sky as excited divers scrambled into small dinghies for the short ride to our dive site near Wolf Island. We descended to a spot where we were surrounded by dozens of scalloped hammerhead sharks slowly swimming by. They barely bothered to look our way as long as we remained still; their powerful, deceptively languid movements were mesmerizing. A group of eight spotted eagle rays, ranging from adults, which were more than six feet (two meters) across to tiny new offspring that looked like toys, approached our position and hovered, checking us out as much as we were checking them out. 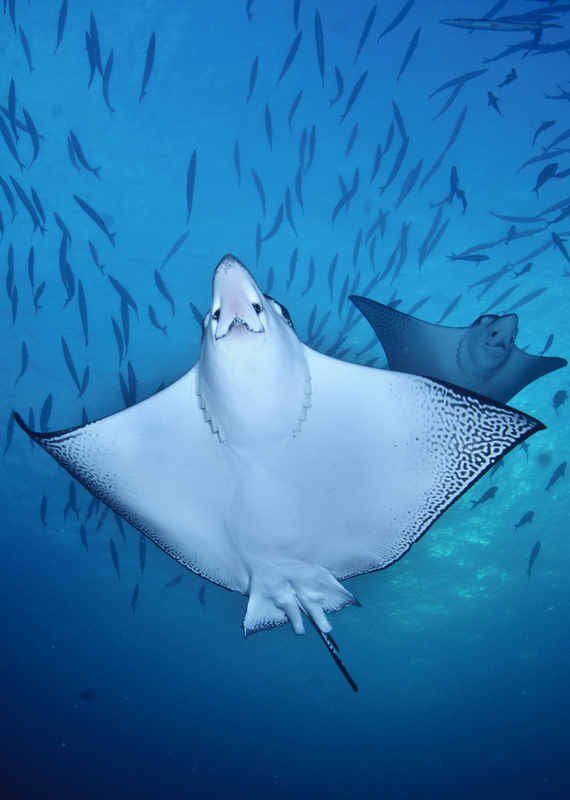 Spotted eagle rays in the Galapagos Islands. Massive Galapagos sharks, recognizable by their beefy silhouettes, passed by far beneath us. A school of hunting tuna, far more menacing than the sharks, passed as well. Before the hour-long dive was done we also saw a bank of more than 50 hammerheads in the distance. The group was so thick with sharks that it looked like one dark, moving mass rather than individual animals. And then the whale shark appeared. Whales sharks are also seen in the Galapagos Islands and their massive forms, up to 50 feet long and 66,000 pounds, dwarf divers. The largest non-mammal vertebrate in the ocean rivals dinosaurs in size and weight, reaching up to 50 feet (15 meters) in length and weighing up to 66,000 pounds (30,000 kilos). This whale shark, the first I’d ever seen while diving, swam slowly past us dwarfing every diver with its size. Then with one small flick of its enormous tail, the giant was gone. The next day at The Arch, the dive site just off Darwin Island at the northernmost tip of the archipelago, we were greeted by even more hammerheads and more whale sharks. Back on the Galapagos Sky each of the divers pretended to be blasé about our underwater luck but none of us was very convincing. The baby-faced captain of the Galapagos Sky. The rush of those dives and the thrill of 16 other outstanding underwater adventures at half a dozen different dive sites in the Galapagos over the course of the week-long trip, was made possible by a behind-the-scenes crew of cooks, deck hands, dive masters, dinghy drivers and a boat captain who looked as if he were barely of legal drinking age, who delivered the unique services and experiences that are the true luxuries on an adventurous trip like this. Live aboard dive boats often access areas not visited by non-divers and that’s certainly true in the Galapagos. Only five live aboard dive boats and a handful of private yachts go as far north as Darwin and Wolf Islands since they are off limits for land visits and the area is just too distant to attract travelers who aren’t interested in diving. Officials of the Galapagos National Park regulate and restrict tourism activity in the area to protect the delicate environment, but there are still about 100 boats licensed to carry tourists in the Galapagos Islands. Most of them stay clustered much further south where it’s not uncommon to be anchored next to other boats. However, the divers on the Galapagos Sky had Darwin and Wolf to ourselves. For 72 hours we didn’t see another boat and our only companions were the juvenile red-footed boobies that made themselves at home on every inch of the Galapagos Sky. That kind of private access was a luxury appreciated by everyone on board. All adventurous activities have inherent risk but diving up to four times a day at deep depths in cold water off a live aboard in a remote location where three ocean currents converge, attracting top predators, is really no joke. Many live aboards, including the Galapagos Sky, will only accept divers with a high level of experience because the conditions demand it. Still, people get hurt or even die while SCUBA diving. It takes experience, skill and special equipment and procedures to mitigate those risks so guests can enjoy the luxury of concentrating on the thrill of the adventure, not the risk of the adventure. 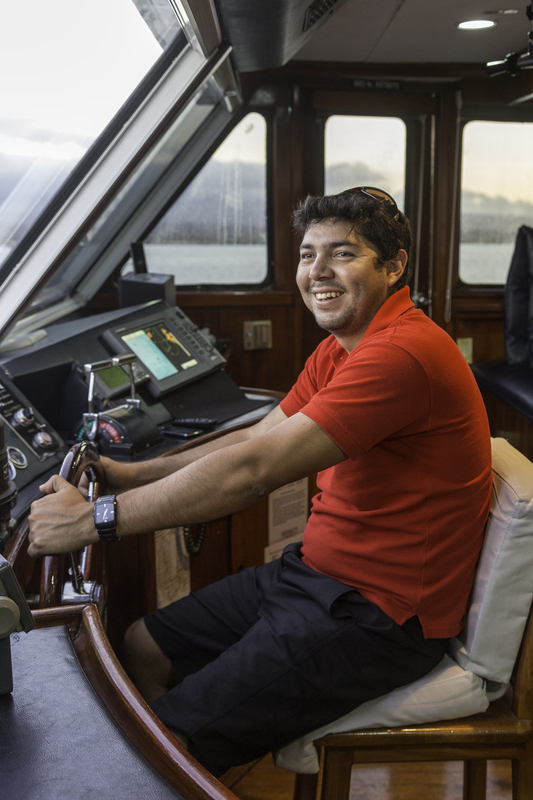 The dive masters and dive deck staff on the Galapagos Sky have decades of experience under their belts and every diver was issued a special waterproof radio and location beacon that could be activated on the surface by anyone who became separated from the group. I definitely thought about my radio beacon, safely clipped and zipped into a pocket of my BCD, during a few hard swims through strong current which could have easily swept me away if I let my attention or effort lapse. On board gear checks, repairs and replacements are another safety-first luxury. When my regulator (that’s the part that goes into your mouth and allows you to breath from the tank) began disintegrating after the second dive of the trip, staff replaced the whole rig before it was time for the next dive. Ask any diver and they’ll tell you that one of the least enjoyable things about diving is getting into and out of a wet suit. While Galapagos Sky crew haven’t yet figured out how to make getting into a wet suit any easier (I’m rooting for a spray on version), they are on hand to help you get out of your wet suit. Crew on the Galapagos Sky were always ready with a helping hand, even when it was time to get out of our wet suits. 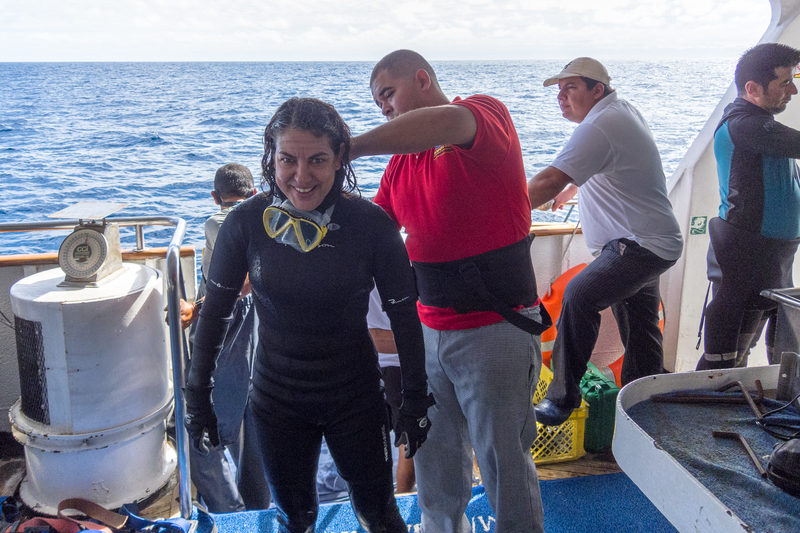 It took a day or two to get used to, but I soon looked forward to the helping hand ready to unzip my wet suit and pull it off my feet as soon as I was back on board the Galapagos Sky after each dive. Staff then whisked guests’ gear into the fresh water dunk and wash tanks before hanging everything up to drain and replacing personal gear near our scuba diving tanks, which were simultaneously being refilled in readiness for the next dive. Because we weren’t busy doing all of those dive chores, our hands were free to select morsels from the tray of snacks being passed and the warm beverages being poured. Slices of freshly baked pizza, chocolate fondue, thermoses of hot tea, prosciutto-wrapped melon and more were all devoured after every dive. 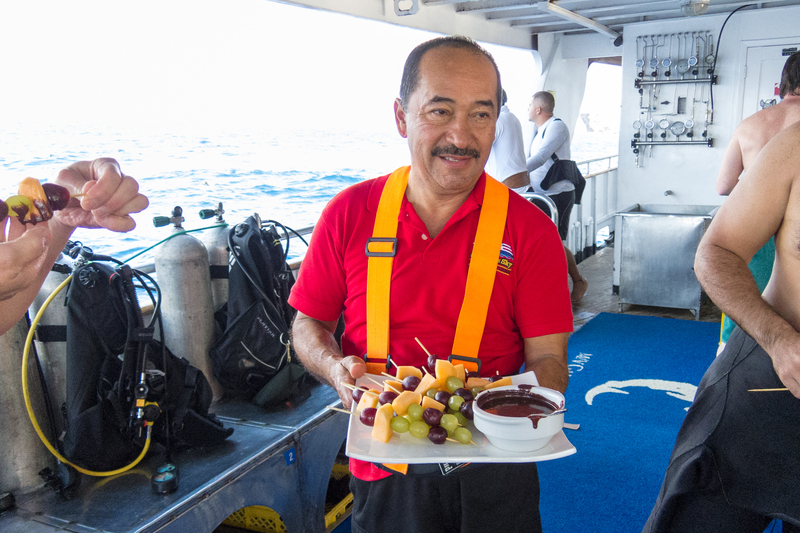 Chocolate fondue was just one of the delicious post-dive treats served on aboard the Galapagos Sky. And did I mention the hot showers on the dive deck to allow divers to instantly rinse off and warm up followed by a crew member handing you a warm towel fresh from the dryer? 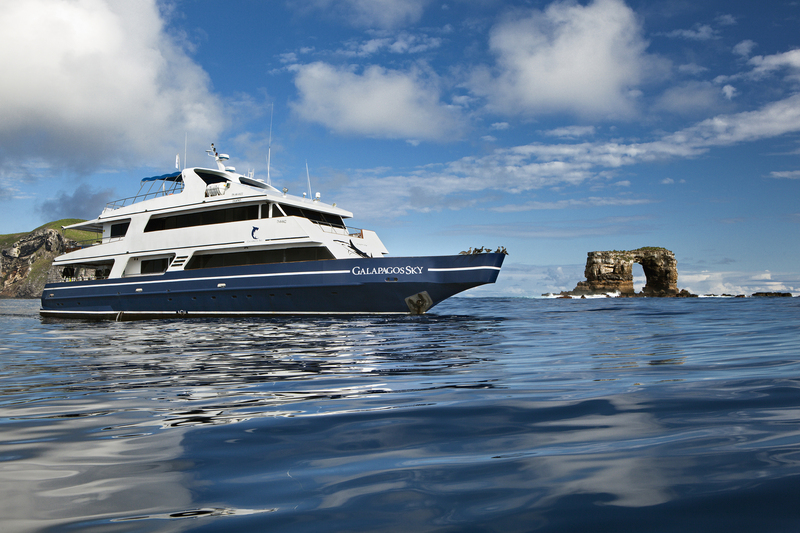 The next group of divers onboard the Galapagos Sky will be in for even more pampering. At press time the Galapagos Sky was in drydock undergoing nearly half a million dollars in interior and dive deck renovations and upgrades before returning to service in early 2015. LAN Airlines and Avianca are the main airlines that service the Galapagos Islands with multiple flights per day from Quito or Guayaquil on the mainland. If you don’t mind heading to the airport at around 4:00 am, I suggest booking the 6:30 am Avianca flight from Quito. Why? Because 6:30 is sunrise time and if you’re blessed with clear skies you will get gorgeous views of the Andes and Ecuador’s so-called “Avenue of the Volcanoes” from the air. There’s a 45 pound (20 kilo) per person luggage limit on flights to the Galapagos Islands but slight overages seem to be tolerated. 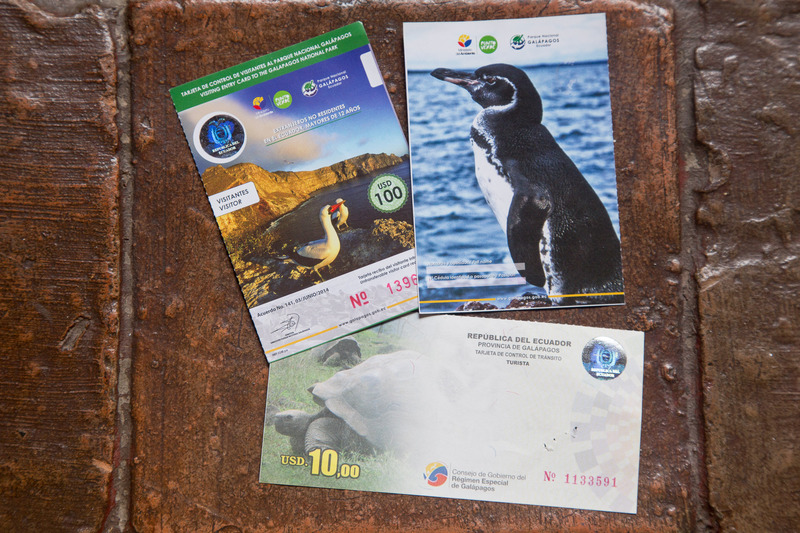 There is a mandatory $10 per person entry permit for the Galapagos Islands. In 2012 Ecuador’s President Rafael Correa abolished national park entry fees at all parks and protected areas in the country except Galapagos Islands National Park. 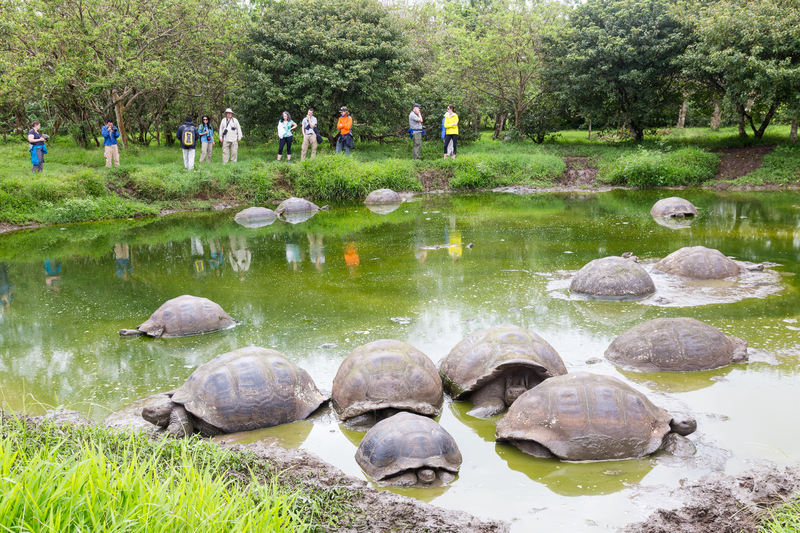 Foreign visitors pay a mandatory $100 per person entry fee to enter Galapagos National. Flights to the Galapagos Islands depart from and return to either Quito or Guayaquil on the mainland. Here are the best hotels to stay in before or after your Galapagos adventure. The most luxurious hotel in Ecuador is Casa Gangotena in the heart of the Colonial center of Quito which is a UNESCO World Heritage Site. Located right on Plaza San Francisco, this meticulously renovated former personal mansion delivers impeccable service, original architectural details, including pressed tin ceilings, an elegant curved staircase and frescoes in some rooms, complimentary afternoon tea, a massive and delicious gourmet breakfast buffet and much more. The hotel scene in Guayaquil is considerably more limited than in Quito. However, the Oro Verde Guayaquil delivers a solid business hotel experience with all the services and amenities you’d expect. Don’t be put off by the profoundly unappealing exterior. In the Guayaquil’s Las Peñas riverfront neighborhood you’ll find Mansion del Rio Boutique Hotel. Finished in 1926 as the home of a wealthy businessman, it was opened as a hotel five years ago following a six year renovation which included the restoration of original furnishings like elaborate crystal chandeliers, rugs, religious statues and amazing wall and ceiling paintings that were done on canvas by artists in Europe then sent to Ecuador on ships. Rooms 1 and 2 are particularly atmospheric and have great views of the wide, ambling Mississippi-like Guayas river just steps away. Karen Catchpole is a full time traveler and freelance writer who spends every night in hotels as her Trans-Americas Journey continues through South America. Her work has appeared in Travel+Leisure, Afar, Every Day with Rachael Ray, National Geographic Adventure, National Geographic Traveler, the Minneapolis Star Tribune, the Toronto Sun, the Dallas Morning News, Jetsetter.com, Indagare.com, RoadsandKingdoms.com, Slate.com, CNN.com and more.